A recent interaction with a scientist left me both bemused, and if I am honest a little bruised. He described twitter as "that rather infantile social network system." Co-incidently Peter Gibbs, an ex-Antarctican, BBC broadcaster and weather forecaster asked me about media work as a scientist - but given my recent interactions I flunked the exam by not answering his question. Sorry Peter. What I did do was write something quickly on why I like twitter. Here it is for posterity. The TL; DR answer is personally I think twitter is good for science, scientists, and for most people really. Why do I like twitter? I cannot sit on the fence. I like twitter and what it offers. I have learned things I never would, built genuine relationships with international people who I would have perhaps have only met over a quick coffee at a conference. And I have changed the way I speak about science. It is interesting, and often funny. It can of course be a harsh and challenging space. I am genuinely horrified at what I have seen some colleagues endure online - particularly the women: but it is here to stay. I wish my female colleagues and women in general were always treated well, and as people, but the only thing I can personally do is contribute to a positive space. I believe twitter is a strong positive for science, and it is a worthwhile investment of your time. This short document has a few ill-considered ideas about what I like about it. Twitter enables you to connect with other scientists and researchers across disciplines and fields. This is becoming more and more important. We can all easily be experts in our own specialism – in fact it is expected. But whenever we talk to our family, the public, other researchers or the media they want and need to know what our work means in a wider sense. Twitter quickly enables you to build a wide network of people with related interests, and if you do not know something you can ask easily. Trivial example? Want to know the best palaeoclimate record of an area you are interested in? Ask the paleo scientists directly on twitter and if time zones match you will get an answer pretty quickly. You can also build relationships with colleagues from other departments, universities and countries. Imagine it as being like working in an open plan office but without the draw backs. Have colleagues in a different university? Just casually keep a conversation going through twitter. In 3 years I have built excellent relationships with many people who I professionally respect, and would love to work with - but without twitter I doubt I would have "met" them. If you are interested in a particular area of science and you have built a network whether to listen or to participate in, instead of one set of eyes trying to pick out things of interest and relevance to your work, you have many. You will find more research, more related media and more <stuff> that is of interest and relevance to you and your work. There are a lot of science meetings going on. In fact it is impossible to attend a tenth of the things you would like to. But with twitter and a hash tag you can listen to a conference virtually. 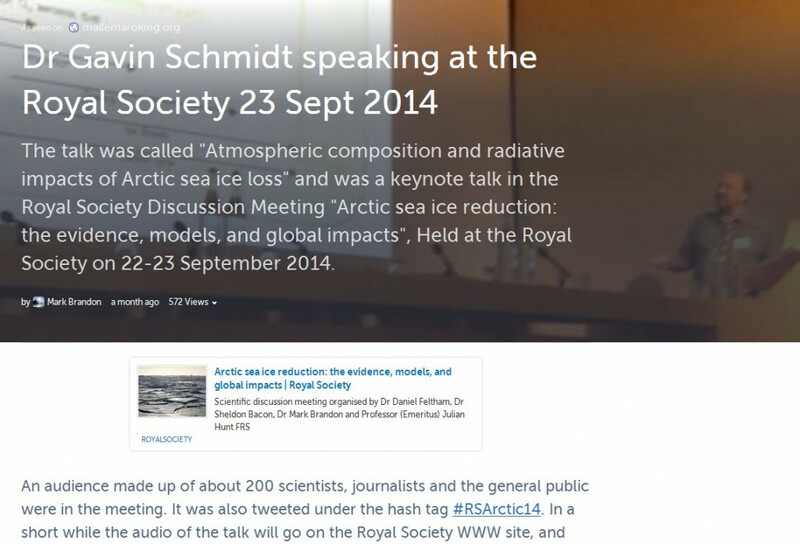 For example, in September 2014 I was the co-organiser of a 4 day meeting at the Royal Society. Over the 4 days of the meeting with the hash tag #RSArctic14, there were ~2600 tweets, and it reached over 340k people online. The hash tag and tweets were contributed to all over the world (the metrics are easily traceable), and we can even break it down it 69% of the contributors to the hash tag were male, and 31% women. Twitter turned what could have been nationally important science meeting into an internationally relevant one. The first is a talk that was at the Royal Society. It has had ~600 views, and tells the story of a view of the potential for Arctic methane clathrate affecting our climate. A storify of a research talk. The second is about melting on the Greenland ice sheet and has over 3000 views. This latter one led to me being invited on Radio 4 and news interviews as I clearly (in someone’s view!) knew what was going on. 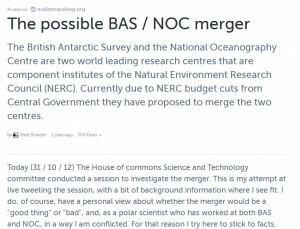 And finally a storify of a House of commons Science and Technology committee I - and others - listened to online about the possible merger of the British Antarctic Survey and the National Oceanography Centre. You can tell complex stories with twitter, and change the ephemeral nature. We all hear horror stories of how terrible online space can be and how negative it is, but in my experience that is a small component. If you tweet something like “I am giving an interview to XXXX” then I would bet virtually all of the responses you would get would be along the line of “you will be brilliant and enjoy it”. OK so some people may think you will be terrible – but even if they do think that, then they very rarely say it. That means it feels a positive space and our online colleagues are in my experience very supportive. If you are a climate scientist you could get something along the lines of “are you going to talk about the co2 scam?” or the “pause”, or “global warming isn’t happening”, but those can sometimes be worthy questions, and part of a scientist’s role is talking to people who ask questions. I have to say l have had many questions that initially I thought were just people attacking me, but with a bit of thought I have learned a lot from the answers to them, and perhaps more importantly why they were asking them. It is worth noting that if you behave horribly online, then you will get that back. If you behave politely and fairly then it is, in my experience, a good space. I have had an experience very recently when a scientist at a UK university complained to my management and just about everyone senior in science he could list through registered post that I had likely “defamed” him online. He issued me and my university with clear and specific legal threats. This was personally a bad experience as I have never encountered such bizarre legal threats before. You can find the story online if you are interested and see if you feel it warranted a pseudo legal attack, but the complaint was found to be without merit. Now I think the reason the person attacked me and some colleagues with the threats is because we passed comments on what he was saying in public. And when we did using our professional expertise and fair comment he called “foul”. In my experience some people think that science communication is a one way broadcast action with no communication. You do see this behaviour on twitter as well. For example if I say “Antarctica is melting”, I should expect clever people on twitter to point out to me at a minimum that 1) Antarctic sea ice has been at a record maximum this year so what on earth do I mean, 2) to ask questions about which bits are melting? and, 3) to ask if there is an anthropogenic cause. So you need to think about what you are saying as you are leaving digital footprints. Expect to be asked what you could perceive as critical questions. But in fact that is good – because it demonstrates people are interested in what you say, and you can sharpen both your ideas, and how you communicate them. I would say I am an introvert. I could go as far as saying I am not a very sociable person. In my experience twitter is the perfect way for an introvert to connect with people. It is basically trivial, you have such short messages – so you cannot give much away, and you get to choose when to interact. It is, in my view, the perfect social space for anti-social people. Have you ever used Google or Wikipedia to find out something work related? Of course! So give something back and be a net contributor the space. So you find something such as a journal article you are interested in, then tweet it with some context for your followers (I personally prefer “listeners” rather than "followers" because the latter implies a dynamic which does not exist). If you, and some of your network do that then there will be a lot of useful links and information for the lay person and colleagues in your subject area. You should also contribute to a Wikipedia article. Then at least you will know it is right! All these things give you the status of someone who people may think actually knows something. (But remember my point 6 above). Journalists and the public will ask you questions and you will get requests to be interviewed. Overall my top tip is make it your mission to add something of value, whether it’s a link to an article you like with comment, or something you have just written. Make the space something you enjoy. Twitter can be funny. You can come across many things that make you laugh, and you can always find things you are interested in but are off your radar. In addition you can interact with people you never would or indeed could. I have had tweets of mine read out on Radio 5 about what logs are used for in mathematics, I have talked to women’s hour about statistics(! ), And as another example: saw a television program last night on Pompey hosted by Professor Mary Beard and you have a burning question about it? Ask her on twitter. In my experience it’s very likely you will get an answer both from the Prof, and from others. Just yesterday I had a great interaction with the makers of the Wonders of the Monsoon about how they made their series. The producers and film makers were wonderfully generous and only too delighted to share their expertise. Most people are. We don't want to work in silence do we? You should be able to tell, by and by, I like twitter. Happy to talk science if your interested - particularly if it's something polar. You should get online and contribute, enjoy and exploit the space too. From the American Geophysical Union we have Building an Effective Social Media Strategy for Science Programs by Wendy Bohon et al and published in EOS. From Darling et al we have The role of Twitter in the life cycle of a scientific publication published in the Peerj. From Letierce et al Understanding how Twitter is used to spread scientific messages. From the LSE and Mollett et al Using Twitter in university research, teaching and impact activities. And finally from Vitae Innovate a Handbook of social media for researchers and supervisors. If you get this far please feel free to post additional useful resources in the comments. Thanks. I asked about additional resources. From Prof Simon Leather we have a great article via Barnaby Smith: Why I Joined the Twitterati: Blogs, Tweets & Talks – Making Entomology Visible. 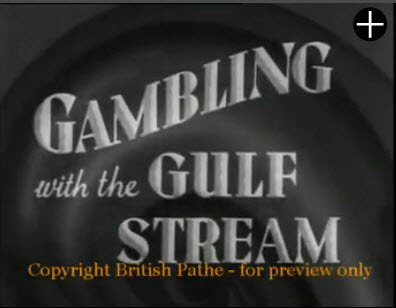 And from Alex Brown a great article Twitter is the conference pub. Posted in Personal, Storify, twitter. Tags: twitter on October 29, 2014 by Mark Brandon.